FAMU setter Elena Dimitrova in the middle of a serve. 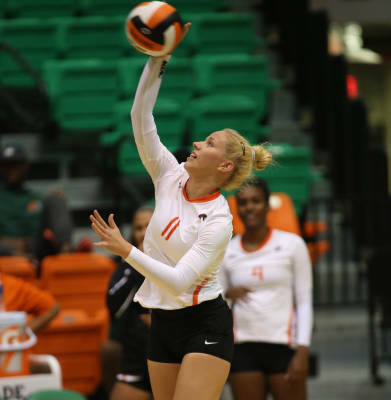 Florida A&M’s Lady Rattlers volleyball team snag yet another win Tuesday night, this time reigning victorious with a 3-0 (25-16, 25-14 25-23) match over the Savannah State Lady Tigers. The Rattlers dominated set one and two of Tuesday night’s match. The third set was close, but FAMU came out on top making Tuesday night’s win the fifth win of the season for the Lady Rattlers. FAMU proved that they had resiliency amid uncontrolled circumstances, such as the moving of some of the matches due to Hurricane Michael. The Rattlers gave the Tigers a run for their money in Tuesday’s match, especially in sets one and two. Maria Yvett Garcia (outside hitter) and Jessica Long (left back) put the ball into play on two separate occasions setting the tone for the match in set one. Valentina Carrasco (left back) kept the energy alive with 19 digs, as teammate Elena Dimitrova (outside hitter) help with assists. Karina Pressoir (outside hitter/ middle blocker) followed by leading the team with 10 kills. Once the Lady Rattlers set the tone in set one, it was very tough for the Tigers to keep up throughout the duration of the match. In set two, the Lady Tigers kept it competitive with FAMU making it a very close set. “On third set we let the Tigers get too many points”, said Elena Dimitrova (setter). “We won 3-0 though, so that’s all that matters. It felt good to get this win with the team.” Her twin sister Radka Dimitrova (outside hitter) added. The Lady Rattlers are in the position to win the South Division in MEAC according to Yilmaz. If they win the rest of their home matches they’ll be in the position to be 9-1 making them the number one team in the south. He feels optimistic about the rest of the season. FAMU will welcome North Carolina A&T at 7 p.m. on Friday, October 26th. Following that they will take on North Carolina Central at 1 p.m. on Sunday, October 28th, and on Friday, November 2 they will go toe to toe with rival team Bethune-Cookman at 7 p.m.